Finding the perfect Landscaping Massachusetts plan for your property takes time. An outdoor kitchen, residential landscape, or structural wall being the project of choice. All of these options enhance your property. Stefano’s Landscaping is a New England Landscape Retaining Wall Company that can provide retaining wall solutions. Banked walls with numerous stone patterns, Retaining walls, are other ways to add character to your property. When you are selecting a retaining wall company, there are variables to consider. When the budget isn’t an issue, their provision of different material types is important. Diamond Pro Stone, Lawn-and-garden project blocks, and others are available. 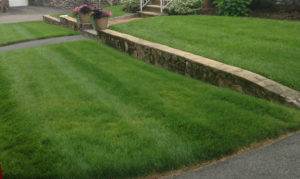 A New England landscape retaining wall company will add value to your home. If you already have a fixture such as a pool, many things can be done to accentuate it. If the pool is already in a deep spot, installing a white or stonewashed retaining wall can be a choice. Segmental walls made from high-strength concrete units do not need frost footings and can be great options. Soil reinforcement materials can be used to stabilize walls. Even those that are up to 50 feet tall can be reinforced, as well as those that are mortarless. A Commercial Landscaping Company MA can best make the judgment call as to what will pair well with the property. Features such as hole-to-slot pinning systems improve stability. Make sure to ask your contractor about concrete units. They are much easier on the environment than chemically-treated options. Concrete is one of those materials that ranks high in sustainability. Preferred by designers, architects, and engineers, it is a favorite for many reasons. Outdoor living spaces landscape designers often recommend a few different techniques regarding downspouts. Avoid having them point at the retaining If it’s against the house, keep soil below the siding. Check HOA regulations, previous to purchasing materials. Calculate the number of rows needed. Divide the ideal wall height by the height of the block. The first row is to be half-buried. Your contractor will mark curved corners, tying a string to the designated stake. Retaining walls bring value. Especially withthe unstable terrain. Use them to hold back hillsides and play a big part in preventing erosion. Installing retaining walls makes Patios, walkways, and driveways effective. For owners of commercial properties, retaining walls can be a great way to “beautify a barrier”. If there is a busy freeway or another complex nearby, it can be a bit of a breakaway. A vintage presentation with a varied planter or iconic lamplight can transfix the location. Retaining wall styles are available that add character to properties. Considering a retaining wall for your property? In unison with other plant landscaping, retaining walls make a location shine. A bit of unique distinction will round off your residence, and you’ll all-around love your new look.